-No-bake mocha fudge cookies inspired by Elana Amsterdam’s famous fudge babies– Add 2-3 Tbsp of your favorite ground coffee or espresso to Elana’s classic recipe! 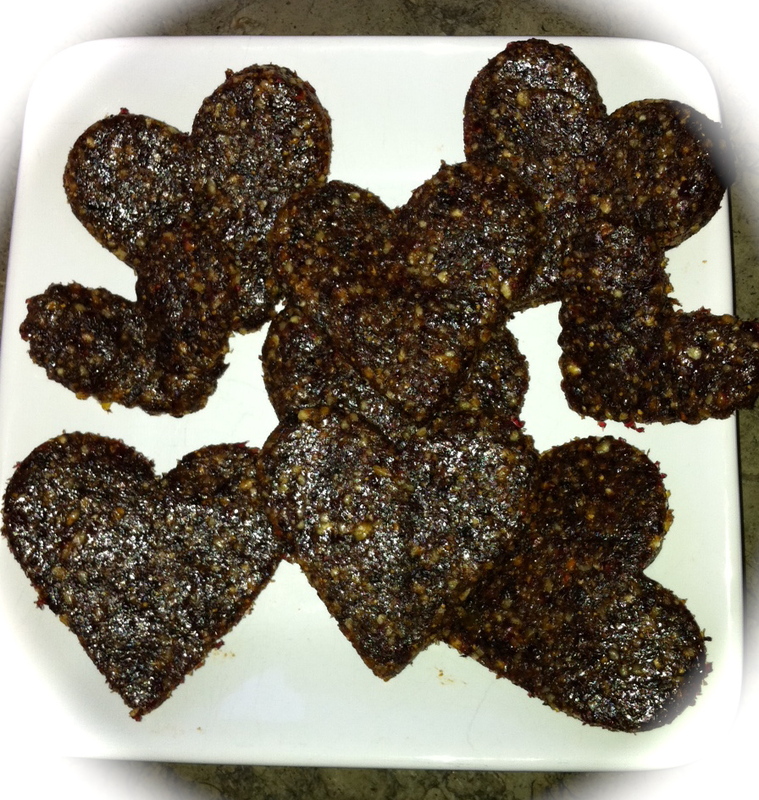 -Home-made heart shaped “Larabars”– In your food processor pulse 1/2 cup pitted dates, 1/2 cup dried cherries or cranberries, 1 cup nuts of your choice, 1/4 teaspoon cinnamon, 1/2 teaspoon pure vanilla extract. Flatten mixture into 8×8 pan to make bars, roll into balls, OR flatten on cookie sheet and cut out festive shapes with cookie cutters. 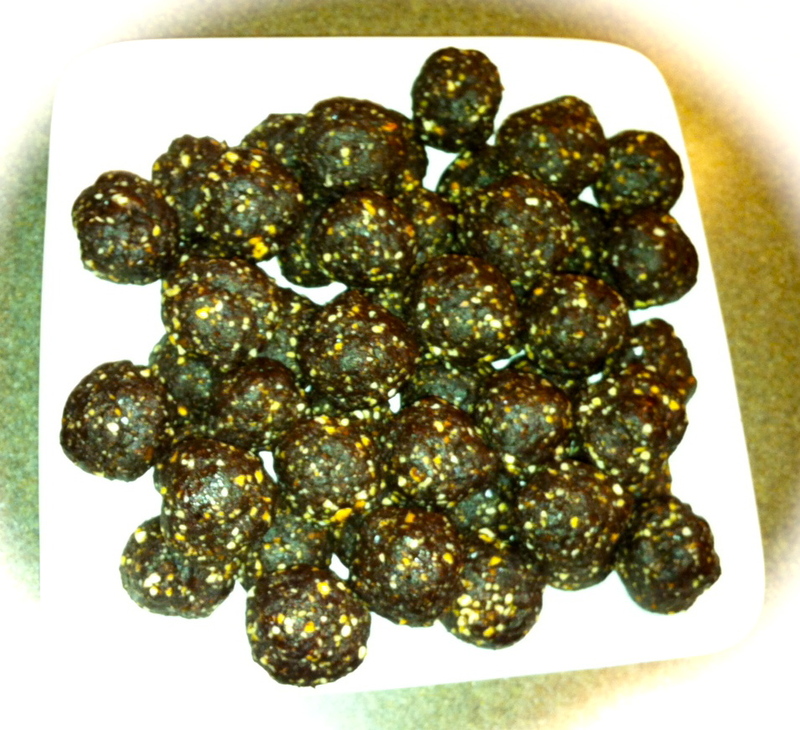 The flavor combinations are endless here: apricots and almonds, coconut, dates and macadamia nuts, add some cocoa powder, throw in some dark chocolate chips…just combine proportionately until the ingredients are sticky enough to take shape. 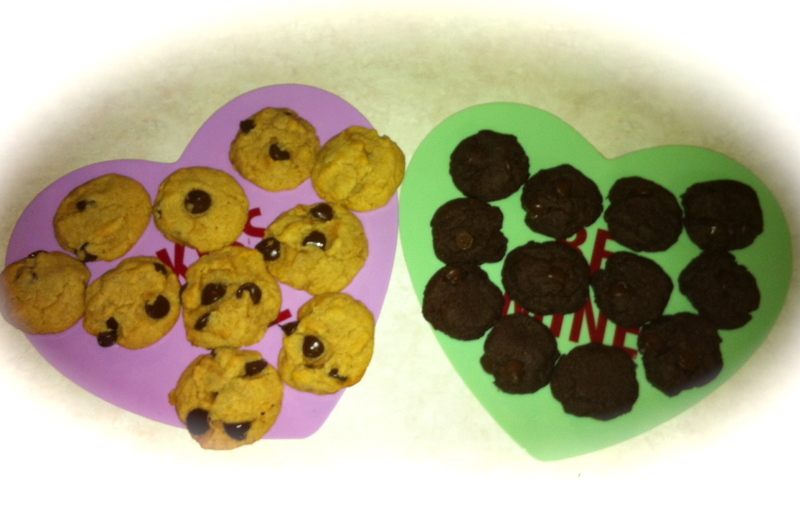 –Classic chocolate chip cookies from Elana’s Pantry – This recipe is tried and true, thank you Elana! You can sub honey for the agave and coconut oil for the butter, and the results are still always crowd pleasing. –Double chocolate mocha cookies from Elana’s Pantry – These are extremely decadent! Again, you can sub honey for the agave and coconut oil for the grape seed oil with amazing results! 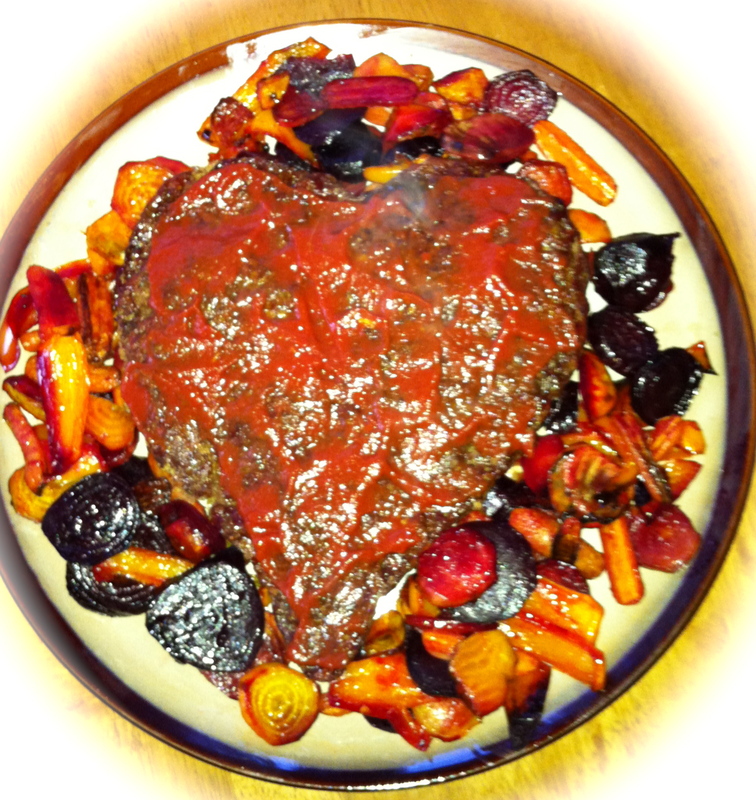 -Heart shaped primal meatloaf with roasted root vegetables– Nothing says “I love you and I want you to stick around on Earth as long as possible” than a heart shaped, grain-free, hunk of meat and veggie primal goodness! This was our primal Valentine’s meal from last year! I will start the morning off with a festive WOD (something like AMRAP 14 minutes of 14 power cleans, 14 sit-ups, 14 push-ups, 14 ring rows, 14 double-unders) because I’m a nerd like that. Between me (who naturally tends to over-do holidays!) and school parties, my kiddos will be inundated with little gifts and treats throughout the day. They are kids, they love it, and it’s just plain fun! My husband and I collectively decided that we “just don’t do Valentine’s Day” which takes a lot of pressure off of us both. Although, I do plan to make a bit of a celebration dinner for the family hoping to make everyone feel a little extra loved. It will consist of coconut crusted salmon, roasted cauliflower and brussels sprouts, and home-made sweet potato fries roasted in melted coconut oil, salt, pepper and cinnamon. 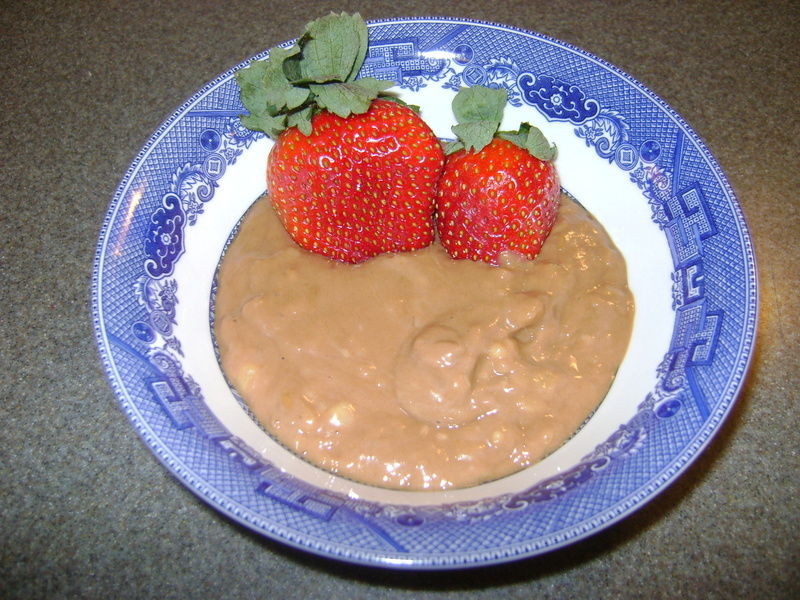 For dessert, I think I’ll stick with fresh berries and either try Leigh’s avocado chocolate mousse (plan to present as chocolate pudding to my kiddos!) or make home-made whipped cream. My husband hopelessly dotes on me every day of the year. I am blessed. I never feel too much of a dying need to set time aside to remember to do this. Still, this year I would like to recognize the fact that we are actually together on Love’s Holiday. Even though I am not a big Valentine’s Day person– I do love doting on my little ones and allowing them to make treats to honor the memory of St. Valentine. This year I think we will put the kids to bed a little bit early… then enjoy a special, quiet dinner together after they are asleep. Most meals feel a little intense in our house. We are there to take care of business, and clean it up quickly. There is not a real moment to truly savor our food or have meaningful conversation. I pine for quiet time with him, and babysitting costs are prohibitive. I think this change of pace will serve us well. When he gets home, I will have hot tea and an appetizer ready for him to enjoy while we scurry the kids through their nightly routine. After they are asleep, our menu will consist of seared filet mignon covered in sautéed mushrooms and onions, with a side of beets and greens. We will finish with hot decaf coffee and fresh berries Normally, I would make a chocolate dessert like the chocolate mousse, or some kind of paleo-compliant tart. But we are currently doing a 30 day sugar rehab, and Valentine’s Day will be no exception for us. 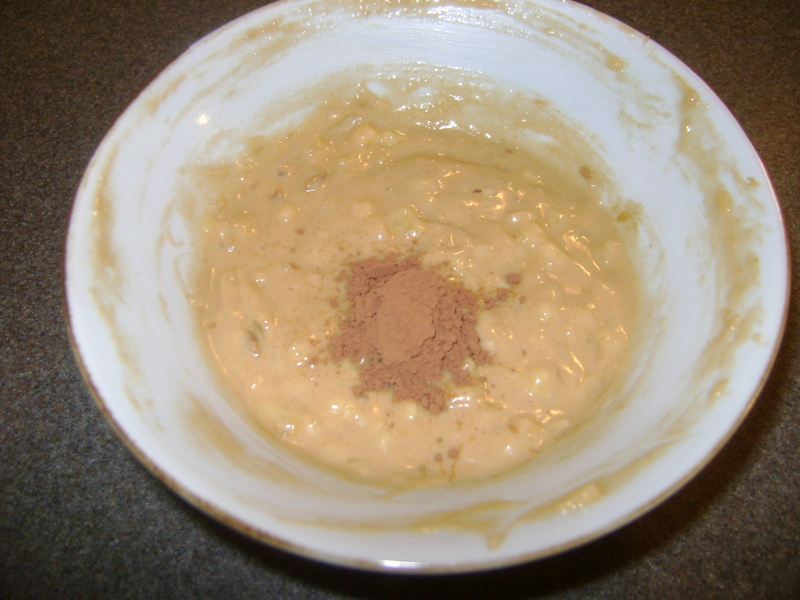 Tonight I came up with a quickly-whipped-together “pudding” which turned out to be really tasty. I know Dallas and Melissa will blacklist me for labeling this a Whole30 option, because they dont like dessertifying paleo foods. But–if you consider this a cheat–it’s a pretty clean cheat if you ask me. In a small bowl, combine the sunbutter and vanilla. 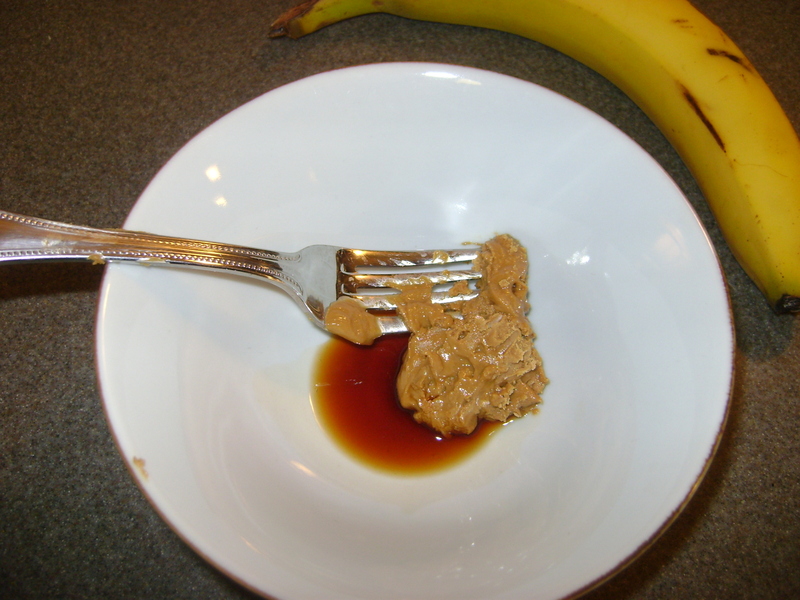 Mix and mash in the banana. Stir in the cocoa powder until well mixed. Enjoy alone or as a dip for strawberries. Demonstrate your love with action! ← What’s in your kiddo’s lunchbox? feeling very inspired to live WELL! Enjoy the evening, ladies. thanks for reading and commenting. thank you also for sharing us with your friends!! Love you mom!